Feeling lucky today? I have something exciting for you. To help celebrate the launch of my free block of the month quilt program in conjunction with Homespun magazine, I have decided to offer a kit giveaway worth $248. 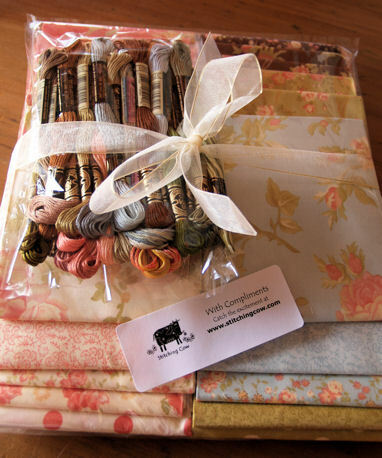 Beautifully packaged and waiting for you to enjoy this kit contains 23 fabrics including the binding and background fabric and 21 threads required for my Faithful Friends Quilt. To be in the running for this wonderful giveaway all you need to do is help spread the word to your sewing and quilt making friends about my free block of the month quilt pattern which is currently being promoted by Homespun magazine at www.completecraft.com.au. If you have a blog simply copy the banner and link included here.To copy right click the graphic and select copy, or select save graphic as. Save it onto your computer and then upload it via your blogging platform. Please use the anchor text free block of the month quilt pattern when embedding the link. To copy the link highlight the complete link then right click and select copy, then paste it into your blog post. Then, most importantly you need to leave a copy of your entry via the comments section.This must include a link to your blog or blog post, or mention of your group and comment. Please make sure that I have a way of contacting you if you are the winner. The winner will be randomly selected one month from today on the 18th June 2011. All international entries are welcome, I will happily post the kit to you wherever you call home. I wish everyone the very best of luck. Fabulous giveaway Lenna, it's a beautiful project. I've added your banner to my blog. Love this project!! I have no blog but have posted this on my facebook page. Looking forward to making a great quilt! Thanks. Fabulous give-away for some lucky winner! Wow, what a delight that would be! 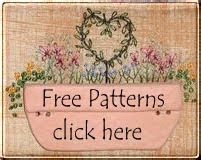 I have blogged about your free block-of-the-month and thanks for sharing your designs. Have a great day! Thanks so much Lenna! Would love to win (lol)of course! I love your stitcheries and it is such a sweet quilt! I blogged about it on my blog! This is a lovely project and great give away for the lucky winner. I would sure like to win so I have posted on my blog. I hope I did it correctly? Love the quilt and all the other patterns that you provide. I don't have a blog and am not on facebook but will tell my friends in my quilting groups about your blog. Thanks for including me in your giveaway. This is a beautiful project and I can't wait to get started on it! Thanks so much for sharing it with us. I don't have a blog,but I am a member of a quilters club online so I posted it there. Awesome giveaway!! I posted your link over on my blog (http://casabooseinstitches.blogspot.com/). I'm very new at blogging but I am learning to share great news like this giveaway! Thanks for the opportunity!! Hi, Lenna, just posted a link to your site on my Facebook profile, love the quilt blocks! Love the quilt and all the other patterns that you provide. I don't have a blog but will tell my friends in my quilting groups about your blog. Thanks for including me in your giveaway. Like everyone else, I would so love to win this great giveaway. What a wonderful giveaway, that is so kind of you. Love the patterns. I will post your banner on my blog. Hi, I'm from MN, USA and a bunch of us fell in love with the quilt. I have entered the link into my facebook page as I don't have a blog. Terrific giveaway. Embroidery is my passion, can't wait to get started. and wrote a description of what is going on! This is the first time I have done this and hope it works. Thanks for this cute giveaway! Love that fabrics! I posted you on my face book page and on a face book group pages for all to see.. Awesome giveaway :) Count me in ^^. I have placed the banner and link to your block of the month on my sidebar and moved it up to the top right of the page. I am purchasing fabric to begin the embroidery tomorrow. Your giveaway is amazing and I would love to win. I do a specific post soon. Thank you for the chance to win this lovely and great giveaway. I just posted on my blog the new bom you've designed. It would be so wonderful to win the kit. Love the quilt. All of your designs are so sweet. Can't wait to see what you cook up next. Hello Lenna, thanks for the splendid giveaway. I've posted the info for "A Faithful Friend" quilt on my blog. such a lovely quilt, if I won. that would make one for myself and one for my adopted sister. Thank you for the chance to enter and win. I enjoy stitchery and know this kit would be fun to work. Added chance to win to my "RedWorkStitchers" stitchery group. Posted a link on my FB page about your contest. Would love to win this amazing kit! What a fabulous giveaway. I just blogged about it. what a fantastic giveaway.I've already posted it on my blog along with the banner. Thank you for this opportunity to enter! I love the look of your quilt. I have posted about your new BOM on my blog as well as adding the banner so more friends can join in on the fun .Thanks for the patterns and the great giveaway . Thanks for the great giveaway and the beautiful pattern. Thanks for the wonderful BOM. I've added your link to by Blog. Your work is delightful Lenna. I have posted link on my facebook page. I don't do many stitcheries but this is so pretty it's a must, thank you! Great giveaway. I've added you to my facebook page, and it even worked. Looks like I am too late - good luck to the winner! Thanks everyone for joining in on the fun of this giveaway. A winner has been selected using the Random number Generator. Congratulations goes to Fiona of Rubz Rugz. This project is so doggone cute! Four of us from our Redwork group are going to do this. We have also passed the word to our group. I haven't started mine yet, as I have a few other projects going that are almost finished. Can't wait. I have downloaded 1-7 so far. We usually get together and work on some of these projects.